It’s Steelers-Patriots week, which means at any given minute most Steeler fans are either incredibly positive (Pats lost to the Bills! The Steelers are at least as good as the Bills!) to incredibly pessimistic (No Harrison to rough up Brady! They always win! Brady outperforms even for him against the vaunted Steelers defense!). Me? For some reason, I have a rather zen state leading up to this weekend’s game. I can’t quite describe it, other than win or lose, there are more games to win after the Pats. Maybe it’s because a loss to New England — on my birthday, during a party with about forty of my closest friends in attendance, no less — last year didn’t mean not going to the Super Bowl. At that even though it was a loss, I still had a good night. And maybe it’s because the Steelers rallied back 23 points in the fourth quarter of that loss. Maybe it’s because the Steeler offense looks better this year than it did last year. Also maybe because I keep also thinking about the Detroit-Denver game which is sadly, on at the same time as Pittsburgh-New England. Studley’s still leading the Football Foodie CFB Pick’em League, but after a brief stumble, Carolina Blue is right back on his heels in second place. Skippy Reed is leading the Football Foodie NFL Pick’Em League, but she’s got CDBarker just a point behind her, as well as last year’s CFB winner, Pretty Girls and Waffles, waiting to pounce in third place. The problem with most popcorn is that it doesn’t taste like anything other than what you put on it, which means it usually tastes like a salted turnpike doused in Paula Deen’s tears. Long time readers of the Football Foodie know I love salt and butter as much as the next person, but sometimes you want to a crunchy snack to actually taste like what it is made of; in this case, something that tastes like toasted corn. 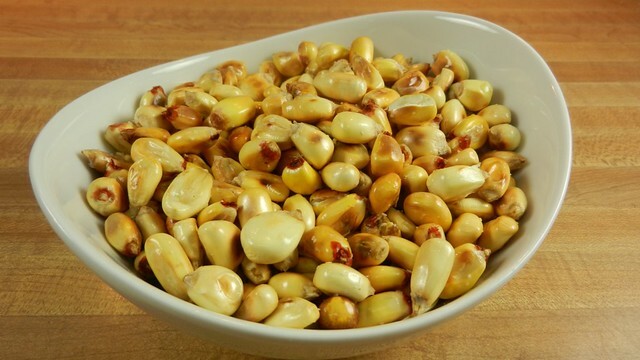 Cancha is a type of corn grown in Peru and toasted over heat like you would North American popcorn, but instead of exploding into a puff of nothingness, it expands just enough in its husk to give it a nice starchy texture while staying slightly moist underneath the crunchy shell. The taste is nutty, earthy and most importantly, like roasted corn. 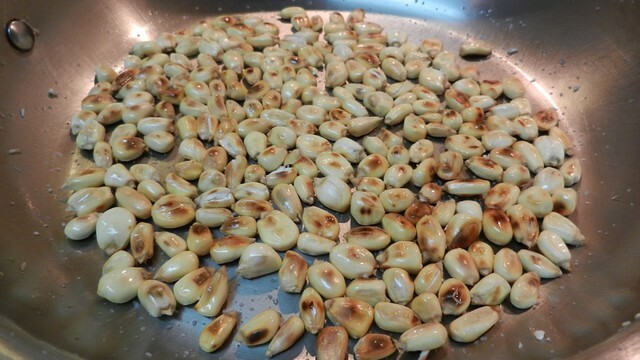 Often you will see people describing cancha like a type of Corn Nut, which makes me wonder if those people have ever actually eaten Corn Nuts. Corn Nuts in my experience are akin to eating salty gravel (probably from the aforementioned turnpike in the previous paragraph) that have no feeling or taste of corn or nuts. Cancha offers a few different textures and notes unlike Corn Nuts, which seem only to exist so I can stare at them in gas station convenience stores and wonder who has a dental plan extensive enough to cover the cost of all the cracked molars they must cause. Unlike freshly made popcorn, cancha also keeps pretty well for a few days in an airtight container, so go ahead and make a big batch for the whole weekend of football. I even think it tastes better on day two than day one. The addicting crunch is perfect with beer or soda. 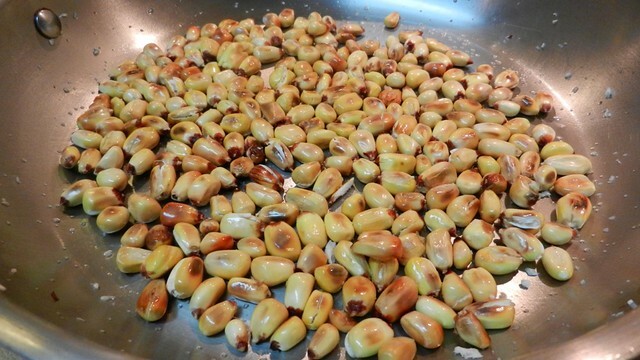 I’ve found that the yellow corn cancha has a slightly more corn taste to it, but I also like making a batch of the white corn cancha after I’ve made the yellow for a prettier presentation. In a large covered skillet, heat the cancha and oil over medium heat, shaking often as to evenly toast the corn and not burn it. After a few minutes, you’ll start to hear the cancha “pop” as it expands, but it will not pop open like regular popcorn. Once that popping has died down, say four or five minutes depending on how hot your stove is, remove from the heat and leave covered for a few more minutes to puff the remaining kernels without burning the corn. Make sure to give it a couple more shakes as it cools. Sprinkle the yellow cancha with a few pinches of salt. A shot of the white cancha so you can see the difference. 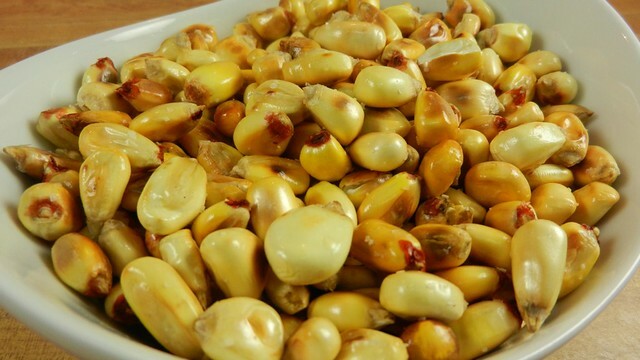 Cancha can generally be found at ethnic markets specializing Central and South American foods for about the same price as a bag of popcorn, so don’t worry, this isn’t some crazy exotic treat. It’s just good snacking. A nutty un-popped popcorn that makes for an easy gameday snack. 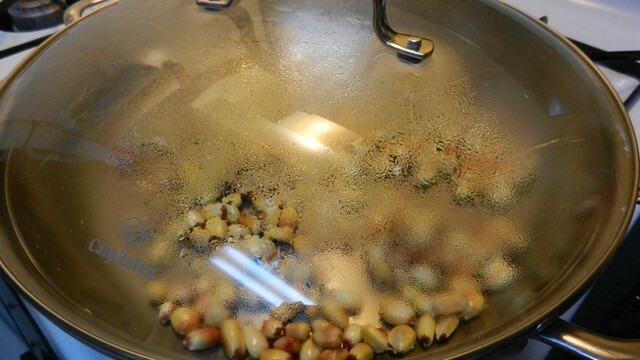 In a covered skillet over medium heat, toast the cancha in oil like you would popcorn, shaking often as not to burn it. Once the kernels slow down in popping, remove from heat shaking occasionally as the last few pieces pop. 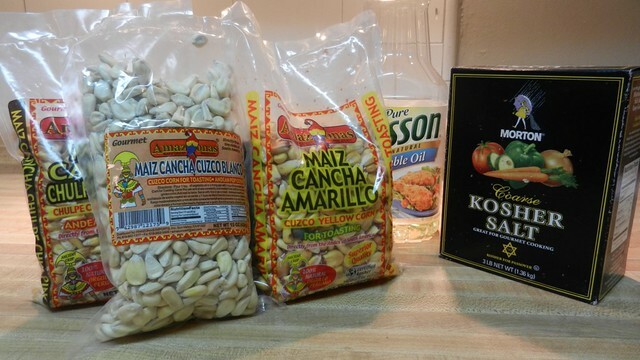 Cancha can be found at ethnic markets specializing in Central and South American foods. Can be made ahead of time.